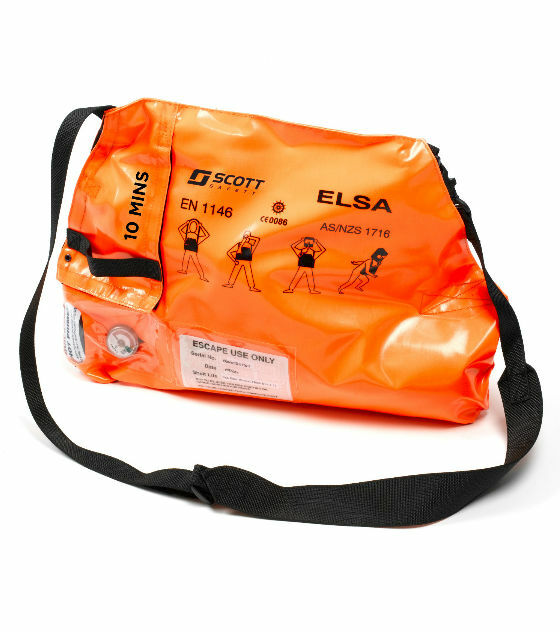 Renowned as the world's leading Constant flow escape set, the 3M Scott Safety ELSA (Emergency Life Support Apparatus) is designed for rapid escape from hazardous industrial and marine environments. Now in its third generation, Emergency Life Support Breathing Apparatus is a concept originally pioneered by 3M Scott Safety under its Sabre Breathing Apparatus brand and the original design principles continue to this day. The current design is simple and quick to operate, reliable and robust in use and performs to the latest European Standard EN1146. The uniquely designed hood is fabricated from PVC coated materials with an ozone resistant neckseal. The three sided flat visor allows the hood to be flat packed avoiding creases to the visor and allowing rapid removal from the bag. The large visor area provides excellent peripherial vision with the hood offering a feeling of unrestricted comfort. An inner mask prevents misting and minimizes Carbon Dioxide dead space. ELSA-10-B Constant flow Emergency Life Saving Apparatus complying with EN1146. Features 2 litre 200 bar steel cylinder to CE Specification and combined pressure reducer and cylinder valve assembly. Automatic activation of valve upon opening of bag and unique design of hood providing optimal vision which can be worn over spectacles and long hair. Bag is orange in colour with universal pictogram instructions. ELSA-15-B Constant flow Emergency Life Saving Apparatus complying with EN1146. Features 3 litre 200 bar steel cylinder to CE specification and combined pressure reducer and cylinder valve assembly. Automatic activation of valve upon opening of bag and unique design of hood providing optimal vision which can be worn over spectacles and long hair. Bag is orange in colour with universal pictogram instructions. ELSA-10-B-AS Constant flow Emergency Life Saving Apparatus complying with EN1146. Features 2 litre 200 bar steel cylinder to CE specification and combined pressure reducer and cylinder valve assembly. Automatic activation of valve upon opening of bag and unique design of hood providing optimal vision which can be worn over spectacles and long hair. Bag is black anti-static material with universal pictogram instructions. ELSA-15-B-AS Constant flow Emergency Life Saving Apparatus complying with EN1146. Features 3 litre 200 bar steel cylinder to CE specification and combined pressure reducer and cylinder valve assembly. Automatic activation of valve upon opening of bag and unique design of hood providing optimal vision which can be worn over spectacles and long hair. Bag is black anti-static material with universal pictogram instructions. 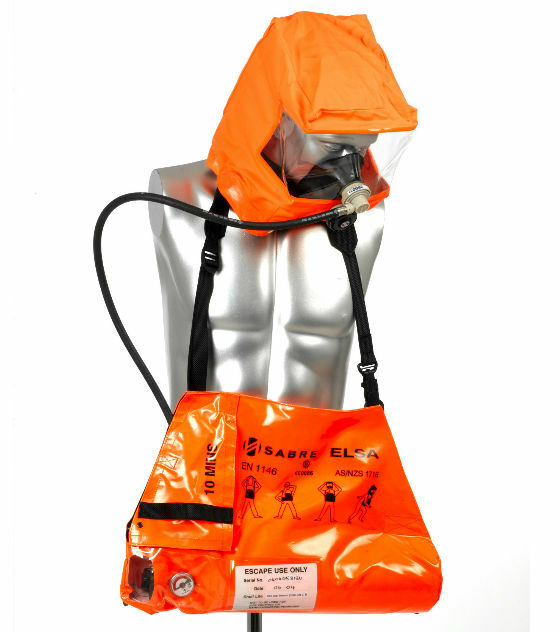 ELSA-10-B-Composite Constant flow Emergency Life Saving Apparatus complying with EN1146. Features 2 litre 200 bar composite cylinder to CE Specification and combined pressure reducer and cylinder valve assembly. Automatic activation of valve upon opening of bag and unique design of hood providing optimal vision which can be worn over spectacles and long hair. Bag is orange in colour with universal pictogram instructions. 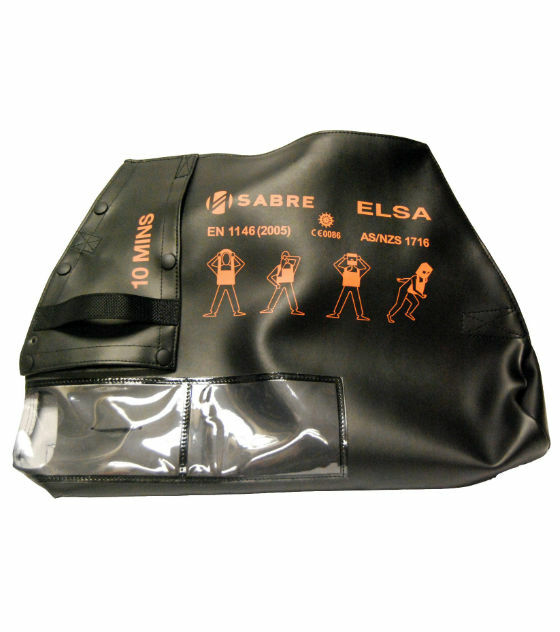 ELSA-15-B-Composite Constant flow Emergency Life Saving Apparatus complying with EN1146. Features 3 litre 200 bar composite cylinder to CE specification and combined pressure reducer and cylinder valve assembly. Automatic activation of valve upon opening of bag and unique design of hood providing optimal vision which can be worn over spectacles and long hair. Bag is orange in colour with universal pictogram instructions. 1035070 084.429.00 User instruction manual - English. 1035993 089.383.00 Testkit & Toolkit.